Homeschool Portfolio Evaluations Shouldn’t Be Scary! For many homeschoolers, student homeschool evaluations are a source of anxiety and stress. Between the horror stories parents hear, misconceptions exploited by the media and the confusing terminology in state homeschooling statutes, it’s easy for parents to let their imaginations get the best of them. The solution is education. Learning about portfolio evaluations and local homeschooling laws can help eliminate some of the stress when it comes to keeping student records for your kids. It can also make the task of putting a strategy in place for keeping homeschool portfolio information much simpler. What is a homeschool portfolio? Do I need to keep a homeschool portfolio? What should a homeschool portfolio look like? How do I choose what to include in my portfolio? How do I use Time4Learning reports in my portfolio? Should I worry about the portfolio evaluation? Homeschool portfolios are a form of student record keeping that documents educational progress. Homeschool portfolios illustrate what your child has learned, how it was accomplished, what resources were used and how much progress was made. It is important to be familiar with the homeschool laws in your state. Laws vary from state to state and many families opt to maintain portfolios for their children even when they aren’t a legal requirement. Many states require parents to keep a homeschool portfolio checklist, while others offer parents the choice of either maintaining a portfolio for homeschool or administering standardized tests. Some states give parents a form to fill out and submit. In many areas, portfolios are recommended and often requested for college admission. Want to know how other parents in your state approach homeschool portfolios and student records? Ask them on our state forums. The most common portfolio is a three-ring binder with subject dividers that make organization and record keeping relatively straightforward. Accordion files can also be a great way of creating a homeschool portfolio. As a paperless alternative, some parents even choose to keep electronic homeschool portfolios for student record keeping. Three-ring binders allow parents to organize samples of their child’s work by using tab dividers. Homeschool transcripts, writing samples, assignments and most other elements of the child’s educational portfolio can easily be dated and placed in their appropriate sections. Clear protector pages can be used to prevent documents from tearing, while pocket dividers and photo-album pages hold items such as project photographs and art drawings that parents often prefer not to hole-punch. Accordion files are a great way to avoid the necessity of punching holes, allowing for a quicker way to file and access papers. With an accordion file, homeschool records, reports and many other materials can simply be dropped into the correct pocket. Electronic portfolios offer an eco-friendly approach to student record keeping. With the help of a scanner and a camera, parents can keep an e-portfolio for their kids right on their computer. This can help to both reduce the mountain of debris and reclaim lost closet space. Offline assignments, field trips and projects can be scanned, video recorded or photographed and saved into each child’s file. Homeschool portfolios are as unique as the families who make them. Three-ring binders and accordion files are a common approach to homeschool record keeping, although electronic homeschool portfolios are growing in popularity. Whether the homeschool portfolio is web- or paper-based, parents who use Time4Learning can run progress reports within the program and simply save or print them for each child’s file. The choice is entirely up to the parent. Typically, I keep a 3-ring binder for each of my kids. It makes it easy to organize their work so I’m not scrambling at the end of the year. Time4Learning has an automated system that grades lessons and keeps reports for student portfolios. Homeschool portfolios are intended to showcase educational progress. Because requirements differ from state to state, the contents will be unique for every student. It is up to parents to learn the laws and choose work samples that best illustrate what their children have learned. Once a quarter, I set aside a portfolio day in our lesson plan — yes, I count that as a day of school! The boys and I go through their work and choose items to put in their portfolios. These days are a good reminder to them of how far they have come in difficult subjects. The items we choose aren’t always perfect. For example, I’ll include both the first and final draft of the same essay. I might also use a math test with a low score and include the correct answers solved by the child after we reviewed it together. How do I use Time4Learning reports in my child’s portfolio? Time4Learning includes an automated reporting system which tracks test and lesson scores, time spent on each activity (for attendance), completed lesson summaries and more. Parents are encouraged to print weekly reports which can be run by date range, subject or activity type. Start by choosing the subjects, activity types and date range. Click the “View as PDF” button. Parents who choose to maintain an electronic portfolio can save the PDF to their child’s file rather than printing it out in step four. It is perfectly natural for parents to be nervous about a homeschool portfolio evaluation, especially when it’s their first time being evaluated. Just keep in mind that the evaluator simply needs to be able to document that your children are learning. Their job is made simpler since they do not have to suggest improvements and modifications, so there isn’t a lot of motivation for them to be overly critical. “I was scared stiff before my first review!” remembers Shay, who teaches her five children in Maine. “Moving from Texas, I had never had to worry about proving anything before. I put all four of my children’s work in one one-inch binder. I felt nervous, but okay… until my friend picked me up and she had a two-inch binder for EACH of her four children! She reassured me and said that she always overdoes it. I was still nervous! “About fifteen minutes into the review, I relaxed. It really was a comfortable, non-threatening environment. It was more like show-and-tell rather than a persnickety proving of what I did to educate my children. And my portfolio was fine. I fell right in the middle. I didn’t have as much as my friend, but I did prepare more than a few others. I have to keep all of my child’s school work. For most of us, this would be logistically impossible. A student record portfolio contains a small selection of your child’s work, intended to give an overview of progress over the course of the school year. I need to keep only the best work. This is actually not the best strategy. Since the purpose of a portfolio is to demonstrate progress, it should contain both low scores along with similar items showing improvement. Take a tip from Cyndy, who homeschools her two sons in Pennsylvania. “Once a quarter, I set aside a portfolio day in our lesson plan — yes, I count that as a day of school! The boys and I go through their work and choose items to put in their portfolios. These days are a good reminder to them of how far they have come in difficult subjects. Every page of my child’s portfolio will be carefully scrutinized. Many parents actually say they were disappointed with the cursory glance given to a portfolio they had labored over for weeks! There is only one ‘right’ way to keep a portfolio. The “right” way is the one that you will maintain on a regular basis! A notebook with index tabs is often used, but if you are likely to put off punching holes and organizing your student’s work, an accordion file might work better for you. Some parents get very creative about how they document their students’ work. One mom simply presented her evaluator with a series of lapbooks — one for every week of the school year. 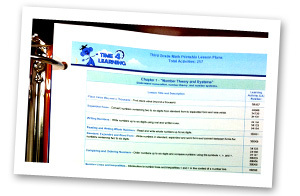 I like that I can print out Time4Learning’s lesson plans and include them in the portfolio with my children’s progress reports. 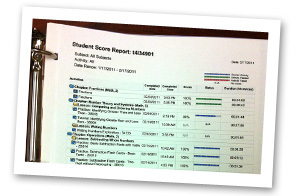 The printable lesson plans correspond with the graded reports, making it easy to stay organized. Joy homeschools her children in Pennsylvania, where portfolios are required. “I will freely admit that I meet the minimum requirements of the homeschool law,” she shares. “Each June, I turn in portfolios and the affidavit for the next school year, so I can count summer activities toward the next school year. We frequently schedule field trips and PE classes in the summer. “We keep an expanding file folder for each student and try to put papers in them from time to time. This is our working portfolio until we put the final one together in May or June. “I try to take lots of pictures of activities to include with the lists in the portfolio. I take pictures of things like science experiments and family living skills like baking bread from scratch, for instance.